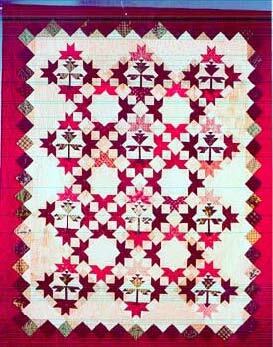 This is a great one for guilds that feel "Quilt Starved". Lyn will show between 45 and 60 quilts and tops giving brief descriptions of purpose and how she arrived at a particular color, pattern or border treatment. Questions are welcome. 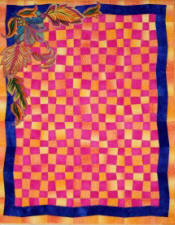 For out of the area guilds, this will be a slide show with 5 or 6 real quilts shown. This is a lecture devoted to borders and all you ever wanted to know about them. 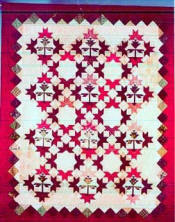 Lyn will show many quilts with pieced borders and explain how she chose and constructed them. Spacer borders will be explained so you can make any border fit any quilt. Time permitting, borders can be planned for guild members quilts. This is a slide show for out of state. 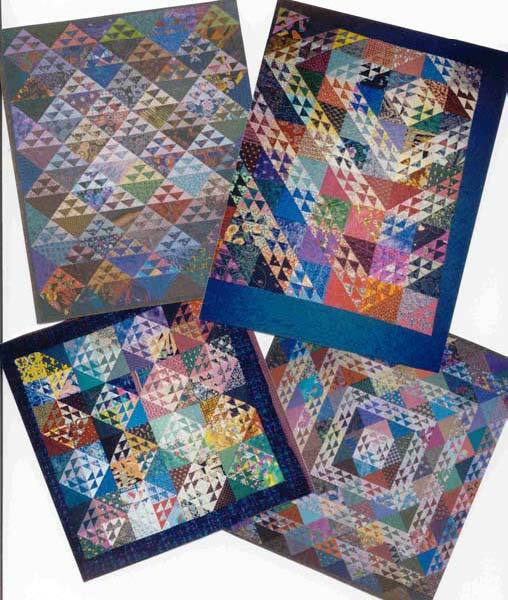 This lecture and slide presentation deals with scrap quilts. Emphasis is placed on the importance of color, value and texture. The slides are followed by a show and tell of some of Lyn's scrap quilts and a question and answer period. This is a trunk show devoted to the concept of “skewing”. I will explain its humble beginnings and expand on the technique and the various ways it can be used. Many different examples of it use will be shown. Mainly slides for out of area guilds. 1. THERE’S NO SUCH THING AS AN UGLY FABRIC. In this this class, students will each bring squares of an ugly (or hard to use) fabric to share. They will also bring a variety of scraps. 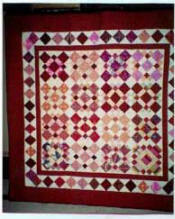 We will construct a simple scrap quilt while learning how to make any fabric great, depending on what you put with it. A really fun day!!! Many say this is the best class they ever had. 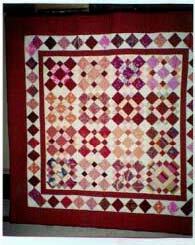 Finally a class that will help you get started on planning a pieced border for your quilt. We will spend most of our time working with the quilts that students bring in and together we will brainstorm the perfect border for it. Simple direction of where to start and what to look for will be covered. There will be multiple handouts listing the basics as well as giving some important formulas and piecing instructions. This will strictly be a design class and the will be no sewing involved. 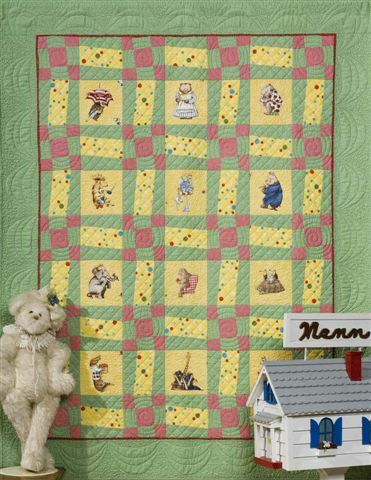 A great class to learn how to put together a memorable scrap quilt. Using an old fashioned pattern, students will put 3 values together in the same block. Position of the values will change from block to block to compare the over-all effects. Emphasis is placed on color selection and values. This class will show the student the difference between an ordinary scrap quilt and a great scrap quilt. The pieced border will also be covered. 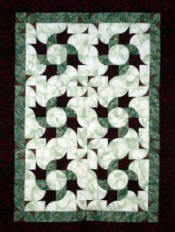 In this quilt, Ivy blocks are surrounded by snow crystals for a dazzling look. Triangle papers are used for ease in piecing. The quilt is finished off with a pieced border. Great scrapped or pinned. 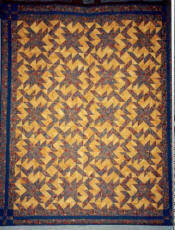 (Appeared on the cover of issue #53 Traditional Quiltworks and Favorite Timeless Patterns by Chitra Publishing). In this workshop you will design and make a quilt based on your birthday. You will bring half-square triangles already sewn. 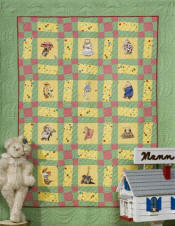 Then we will sew groupings based on your birth month and day. After lunch, we will work with these two groups to design our very own special block and quilt. There are many possible designs for each date so no two will look alike. A really fun experience. Learn basic 'skewing' technique while making a great baby quilt. We will make 9 patches and rail fences and then skew them with a special template. many will leave with the top finished. From the book "Skews Me". This workshop teaches the students a new concept called 'skewing'. We will start with creating a center background using two fabrics and making 9 patches. these will then be skewed with a special template. 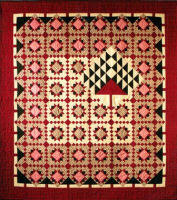 A pieced border is also made. This will give the student a canvas on which to appliqué. 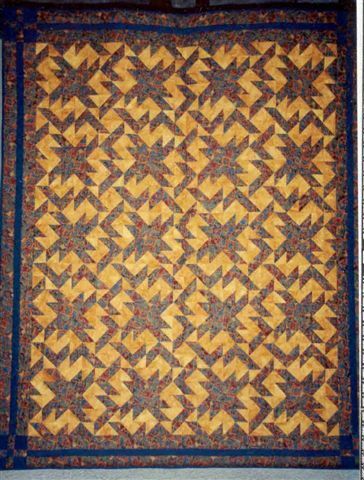 In this class, we will replace half-square triangles in traditional blocks with a curved two-patch to give a whole new contemporary look to old favorites. A great new design adventure with untold possibilities but easy enough for the near beginner. The "Creative Curve" ruler will be used for ease in rotary cutting.